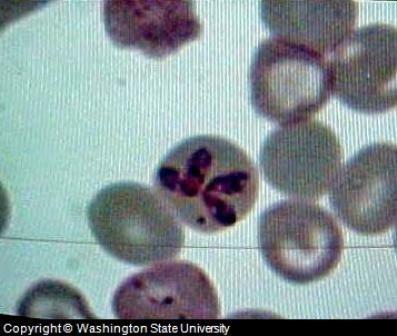 Canine Blood Tests detect problems in the blood such as this sample which contains a parasite (Babesia canis). Test was conducted on dog suffering from fever and anemia. Red blood cells are examined for packed cell volume (PCV), the proportion of RBC (red blood cells) in whole blood, Hemoglobin (Hgb) concentration, and RBC count. All of these estimates seem similar but have a different impact on the diagnostic approach to different conditions; collectively these assessments are based upon morphology and number of RBC's in whole blood. Size; Cells with normal size are termed “Normocytes”, and abnormally large or small cells are referred as “Macrocytes” or “Microcytes” respectively. Color; Normochromic refers to normal cells while “Polychromasia” refers to any variation in cellular color. Consistency of RBC is also evaluated on the basis of its color, e.g. “Reticulocytes” are large, bluish cells, which have remnants or a malformation of the nucleas in it. Similarly, “Annulocytes” are those cells, which are pale and have very low levels of hemoglobin in it. In terms of the number of red blood cells (RBC), packed cell volume or (PCV) is used, this include complete counting of all contents related to red blood cells. PCV is most commonly performed in evaluating different forms of anemia, polycythemia etc. White blood cells are classified as granulocytes (neutrophils, eosinophils and basophils) and agranulocytes (monocytes and lymphocytes). WBC count and evaluation is usually required to assess the immune status of a dog, for disease such as leukemia, food borne diseases, drug reactions, cancer, parasitic infestations, allergies, inflammation, and infections. Different types of WBC, either granulocytes or agranulocytes are counted and evaluated in different conditions, depending upon the results of basic canine blood tests performed in a laboratory. In mammals, platelets are pale, blue and granular bodies that help in maintaining the integrity of the endothelium (epithelial cells line the serous cavities, lymph vessels, and blood vessels), and facilitate the clotting and repair procedure. These are evaluated either for any increase in numbers, e.g. triggered by injuries, trauma and prior to surgery, or are evaluated for their decrease in number, e.g. in autoimmune reactions and blood disorders. Blood chemistry or the qualitative evaluation of canine blood is a detailed study of blood plasma for different substances such as hormones, enzymes, substrates etc. Qualitative canine blood tests are usually not possible without a complete hematological profile. Therefore, canine blood chemistry is an advanced form of hematology which is used for advanced studies and confirmatory approaches. These studies are not only performed to assess the serum or plasma, but also for the association of different systemic diseases with the findings, which can be evaluated during the diagnosis process such as diseases of the pancreas, liver, kidney and spleen.